A big thank you to Universal Pictures Home Entertainment for sponsoring today’s post! We received compensation for writing this post but all opinions expressed are my own. 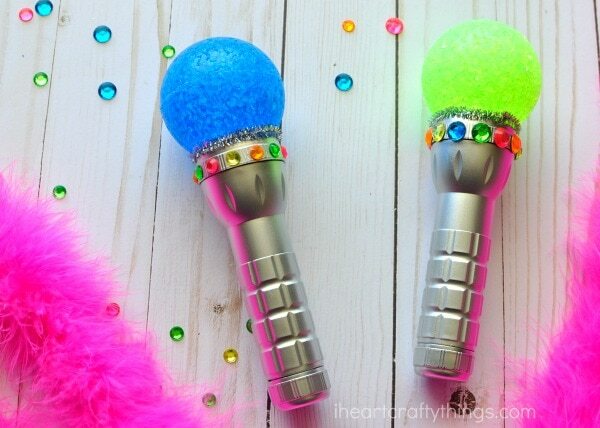 We hope this glowing rock star microphone craft inspires hours of singing fun in your family like it has ours. My daughter has been in rock star and pop star mode ever since she saw Universal Pictures Home Entertainment’s new movie SING. She already loved singing but the movie has brought her creativity and dreams to a whole new level. She now enjoys dressing up in her pretty dresses like her favorite character, Ash, and she loves writing her own songs. After a few days of her performances I could see that her ensemble was missing a key rock star component…a microphone. 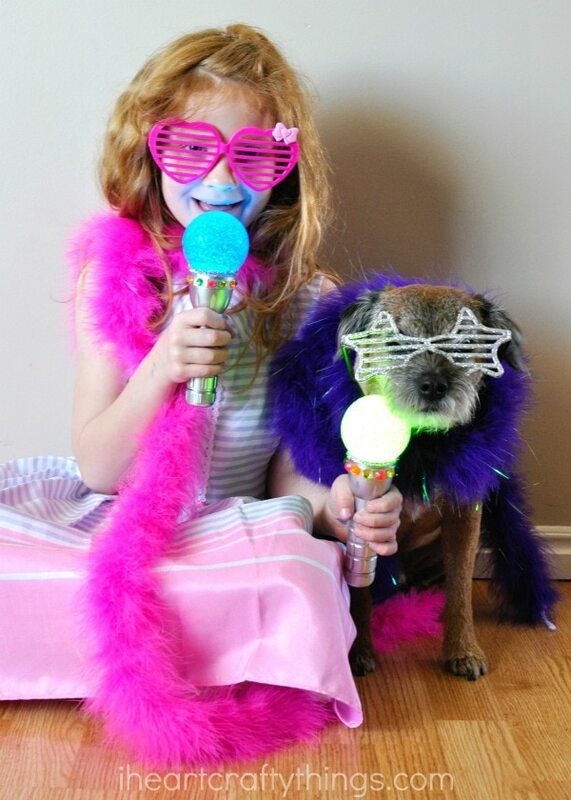 A short trip to my local dollar store, 3 easy diy steps later and our glowing rock star microphone craft was born. Now everyone in the family can’t stop singing and dancing. 1. 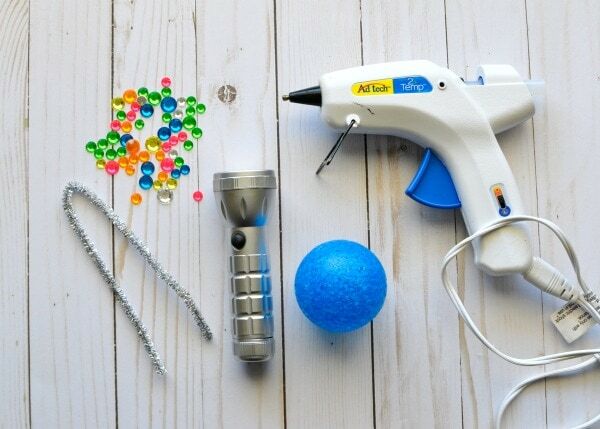 Gather your supplies and heat up your hot glue gun. Add hot glue along the inside rim of the flashlight and a lot right in the middle of the flashlight lens. 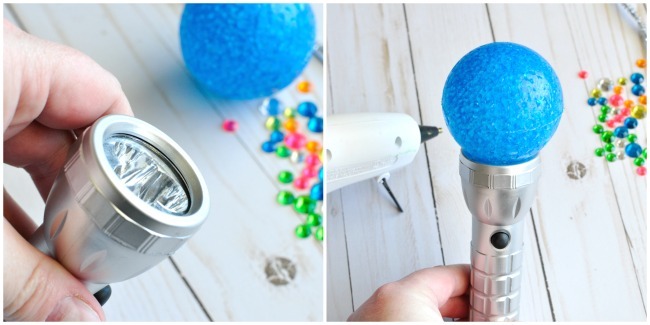 Then quickly place the ball onto the glue on the flashlight. Hold it down tightly in place for about 15 seconds to let the glue dry. 2. Cut your sliver pipe cleaner to a length that fits around the the top base of the flashlight. Hot glue the piece around the top of the flashlight so it hides the crack where you glued the ball onto the flashlight. 3. 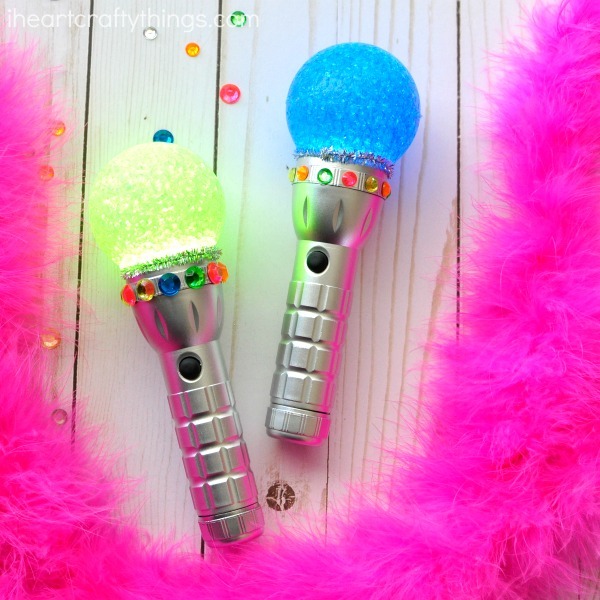 Choose some craft jewels you would like to use to decorate your rock star microphone craft. 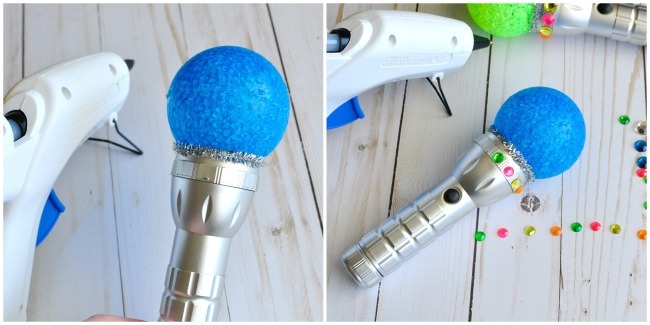 Use the hot glue gun to attach them to your microphone. Now the awesome glowing rock star microphone craft is all ready for play! 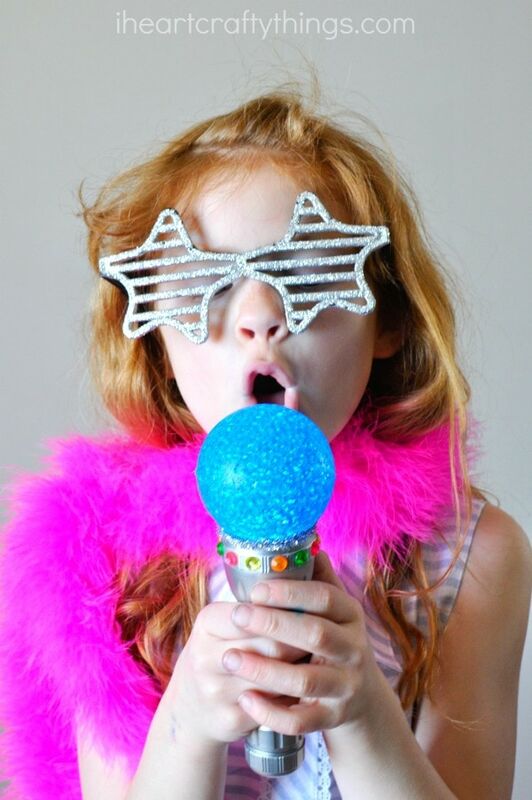 Kids can dress up in fun rock star apparel like a feather boa, shiny glasses, or a leather jacket. Then press the button on the flashlight to turn on the glowing microphone and sing your heart out! 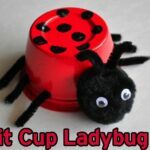 This microphone craft would also be fun at family karaoke night. Dim the lights while you sing so your microphone gives you an extra special glow. Two microphones come in handy when you want to sing a duet with a family member or if you have your adorable dog as your back up singer. 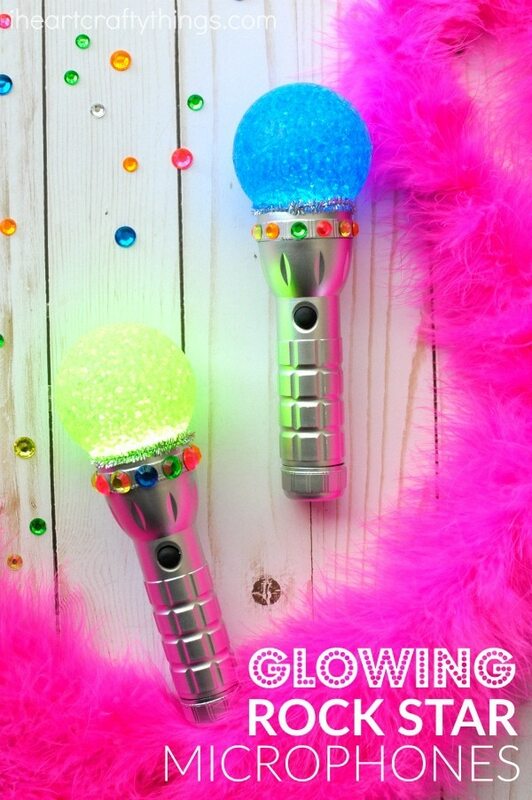 Wouldn’t this glowing microphone craft be a perfect touch for a SING-inspired birthday party?! You can buy SING on Blu-ray & Digital HD today! SING follows the journey of Buster Moon and his attempt to save the theater that has fallen on hard times that he has worked all his life to run. In attempt to save his crumbling theater, Moon creates what he believes is the world’s greatest singing competition. Follow the journey of Moon and his five lead contestants that are trying to reach their dreams and change their lives! 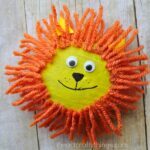 Looking for more fun SING-inspired ways to connect with your children? Scholastic and Universal Pictures Home Entertainment have partnered together to bring parents amazing Dream! Make! Create! 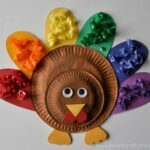 ideas where you can connect with your children through activities and craft ideas. Purchase your new copy of SING on Blu-ray & Digital HD today and then head over to Scholastic to plan your SING-inspired family movie night! This is a sponsored conversation written by me on behalf of Universal Pictures Home Entertainment. The opinions and text are all mine. That is awesome! I love it. And the pictures of your rock star daughter are so cute!